I am back from a few whirlwind days in Edinburgh squishing wool and talking knitting with other “woollenistas”. The knitter in me loves a good yarn festival as I can check out beautiful wools from indie producers and dyers that are often only available online. The sustainable consumption researcher in me is a little conflicted about these events as they can turn us into a kids in a sweet shop who want to gorge on everything. But as a researcher into the power of grassroot niches, and online communities in particular, I quivered from start to finish as Edinburgh Yarn Festival isn’t just another wool fair! There is no shortage of yarn shows in Britain but Edinburgh Yarn Festival, a relative newcomer, is definitely carving out a place in the heart of a knitting and crochet tribe thanks to the vision of its organisers Jo and Mica. Whilst others event managers cram halls full of market stalls, these ladies, knitters in their own right, produced an event that celebrates amazing wools, a wealth of skills and talents and the community and camaraderie of knitters. The organisers got the show off to a super start by organising an informal knit night on the eve of the festival. 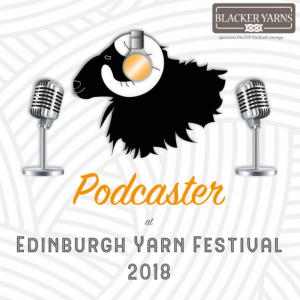 Imagine some 300 knitters and crocheters taking over an Edinburgh bar and the happy hum of folk with a shared interest, many of whom only knew each other from Ravelry, podcasts, blogs and social media. Despite the busy schedule of workshops and vendors’ woolly wares, there was plenty of scope to carry on conversations started the night before or meet new people at the festival itself. Nearly half of the venue was devoted to a place to sit, chat and knit, either over a restorative cup of tea and slice of cake or in the Podcast Lounge – a comfortable corner organised by Louise Scollay of Knit British* where you were sure to find a knitter, crocheter or spinner equally passionate about woolly pursuits. A key theme to emerge again and again was provenance of wool. And the organisers certainly obliged with their careful choice of vendors! Amongst the colourful array of superwash merino and super soft alpaca there were also many small independent producers and dyers of yarns infused with a profound sense of place. Like the exquisite new long wool blend Tamar from Blacker Yarns, an independent fibre mill in Cornwall that promotes British breeds and aims to add value to the fleeces from British flocks. 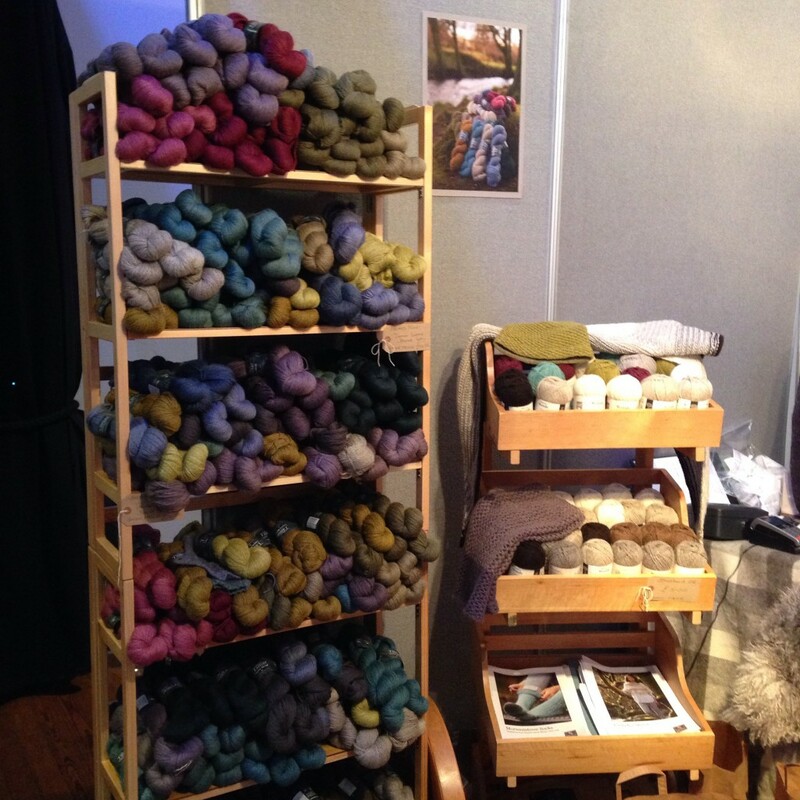 Or Buachaille, the Scottish raised, Yorkshire spun wool range developed by Kate Davies. As this phenomenally talented lady designs knitting patterns inspired by place and history, it is no surprise that her newly developed yarn is similarly rooted, both in its origins and colour palette. Or the beautifully hand dyed yarn by Ripples Craft with its colourful blends inspired by the stunning scenery of Assynt in the northern reaches of the Highlands of Scotland. Or The Knitting Goddess’ new yarn, which combines soft Shetland wool and the long fibres of Wendleydale sheep to produce a nylon-free sock yarn. One of the absolute gems was a new yarn called Daughter of a Shepherd. This 100% Hebridean wool in its natural bitter chocolate shade is exactly what the label says! Dismayed by the obscenely low price paid via the Wool Marketing Board for the fleece from her father’s flock, Rachel Atkinson set about finding scourers and a mill in Britain that could turn the clip into a yarn that would showcase its qualities. 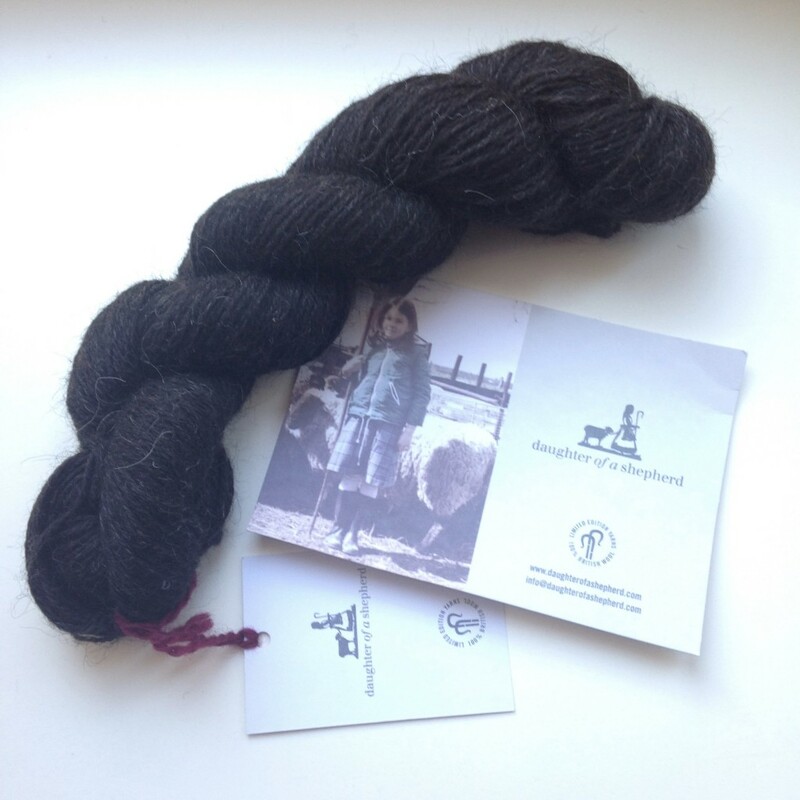 Whilst purchasing a prized skein of this wool, Rachel explained how developing the yarn was not just about celebrating her father’s sheep or the breed but also about supporting local industry and skills that are in danger of disappearing. From a sustainability perspective a yarn fair like this is not free from paradoxes and none of the yarns, individuals or companies are in themselves a solution to the many environmental, social and economic challenges we face. However, both the knitter and sustainability researcher in me left the Edinburgh Yarn Festival buoyed as appreciation of local resources, connection with place, interest in provenance, support for small businesses, celebrating skills, deriving pleasure from making… are all key to developing a more sustainable society and economy. As is community… which, judging from my three days in Edinburgh, is well and truly alive in the knitting, crochet and spinning sphere! * Knit British deserves a particular mention. Through her podcasting Louise Scollay has not only made a major contribution to raising the profile of British wool amongst knitters and crocheters, she also has a real talent for building community. In a recent project she has encouraged knitters to explore single breed wool and write up their findings to create a collective online resource about the distinct knitting properties of British wool breeds. In keeping with my usual policy, I am not affiliated with or sponsored by any of the small businesses, blogs or websites mentioned here. If you are eager to explore British wool, I would however definitely recommend you check out any of the wools listed here. Another good starting point is BritYarn, an independent online wool shop that only stocks British yarn and is refreshingly transparent about its sourcing policy. If you are not based in the UK, by all means explore the wonderful world of British wool but I would also urge you to check what fibres are available in your own area and support skills, businesses and supply chains local to you with your knitting. Love this post, it sums it all up what EYF means, I behaved more like a child in a candy shop but EYF is for me really become the main moment in a year to shop for yarn. 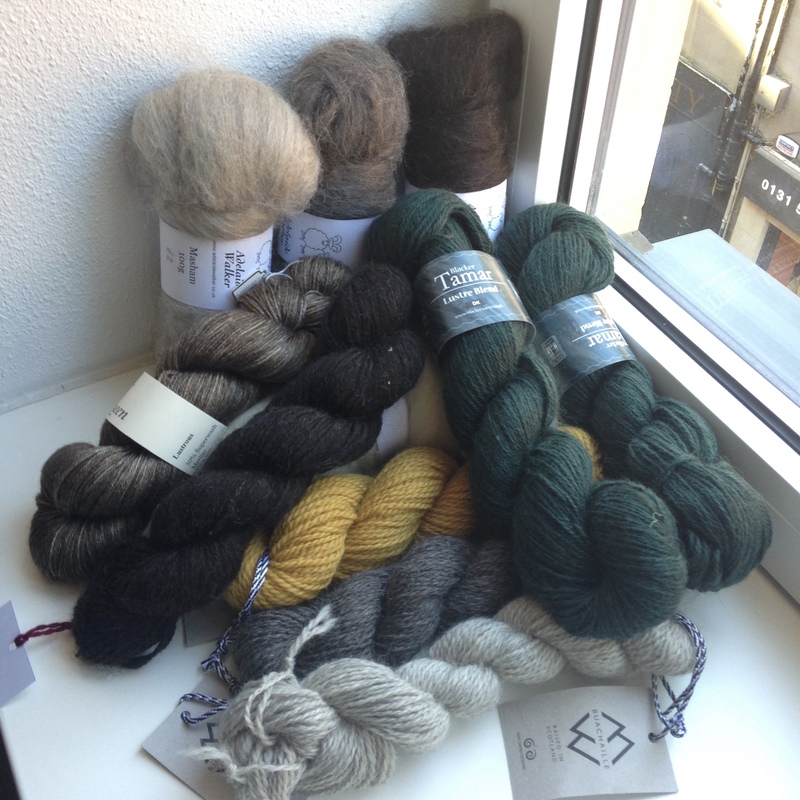 Finding local yarn is hard and British seems quiet local, but sending costs a lot. And I realise my purchases and plans are way too ambitious for one year, but you never know, right? My first shawl from the EYF haul is almost finished, who could have imagined that. It was also very nice to see you again off course. 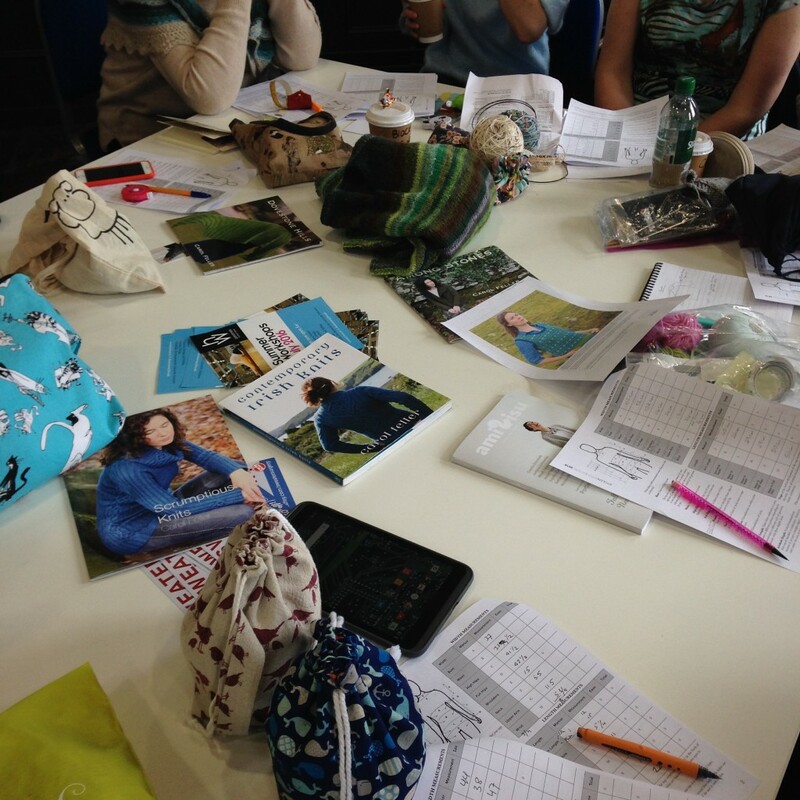 It was lovely to revisit EYF through your blog post. Fascinating to read about this. Unfortunately, EYF was not at the same time as the Edinburgh Festival, which I visit every year…….if only they could have coincided!